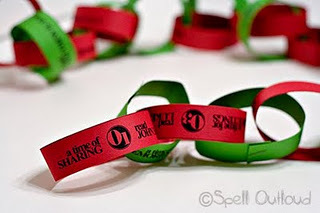 I discovered this awesome advent chain idea idea here. Spell Outloud is a blog written by Maureen, a Christian homeschooling mom of 6 and former teacher. I've loved reading all her wonderful ideas. There are so many ways to celebrate the days leading up to Christmas and there are a ton of fun advent calendars that you can make or buy. And I mean a TON! This one is different from all the ones that I've seen. I love how it really points back to the real reason for Christmas and the idea of reading a short verse from the bible that is relevant to this season. It's a free printable and is so easy to use. It also made for great patterning and counting practice. We can't wait to start this tomorrow!